I was 11 years old in 1966 when the original Star Trek series debuted. I followed the show devotedly, though in those days the family had no color TV (and so I saw it in black and white) and only one TV (so sometimes I was overruled on what to watch). Later, when the show went into syndicated reruns (typically 5 days a week), I became obsessed by it and watched it as often as possible (by this time in color!) through my high school and college years. During this period I finally saw the dozen or so episodes I had missed on first run — but syndicated reruns were always cut by a few minutes, sometimes crudely, to allow for extra commercials, so I didn’t necessarily ever see *all* of those episodes. Eventually I moved on to broader interests and tastes, and while I watched some of the later Trek TV series and movies, one time each at best, I retain a fondness only for the original series. After some decades, in 2017 I began a systematic rewatch of the series on Blu-Ray, armed with a collection of related books including the trio of recent books by Marc Cushman, and the recently released the complete soundtrack collection. Below are links to those sources, then to the first season episodes, with some introductory and concluding comments. Considering the episodes at face value, to what extent do they make sense, or not? Considering my slightly dicey history of seeing the original series, mostly in syndication when I was a teenager, would there be scenes in the complete episodes that I would not recognize, because they had always been cut from the syndicated reruns that were the only versions I ever saw? Considering Cushman’s books, what insights into the production process, especially how early drafts of the stories changed, or how the results were affected by post-production, might influence my understanding of the final episodes? Considering the era in which Trek was made, how did cultural values of the time, especially the roles of the sexes, and also the presence of physical violence, justify what we see in those episodes that would not be considered appropriate today? Considering the remastered episodes – in which the special effects of the 1960s were updated to the special effects of 2009 or so – would they truly be improvements, in the sense of correcting the astronomical and physics errors of the original productions? Considering James Blish’s ‘novelizations’ (or ‘episode short story adaptations’ to be more accurate), how do they reveal changes in stories from earlier scripts, or did Blish in some cases make improvements on the original scripts? 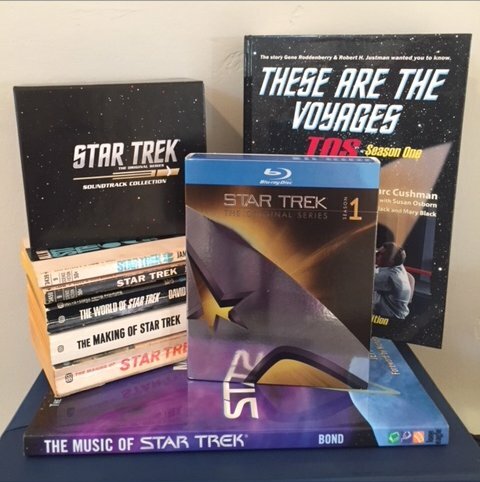 Considering Trek’s music, with so many themes that became familiar without always identifying themselves to any particular episodes, how would study of the ultimate CD soundtrack set, and Jeff Bond’s book, inform understanding of how those themes were created and developed? The episodes are listed here in production order, not the order of original broadcast. Each page follows key points in the episode’s plot, with the first six considerations above cited as appropriate, followed by separate sections for the last two considerations [in work]. Further discussion of James Blish’s episode adaptations of first season episodes.